It is no secret that Visa and Mastercard will do everything they can to keep a firm grip on the payments industry all over the world. Credit cards are one of the most often used payment methods, even though the medium is not all that secure. Visa’s new project, called Visa Checkout, is getting a lot of attention from established brands who focus on online and mobile commerce. When it comes to tackling the payment industry right now, businesses are exploring options in both the mobile and online world. Some countries, such as India, are seeing a major boom in mobile commerce, whereas the Western world sticks e-commerce for the time being. Visa Checkout offers a solution that can cater to both worlds while having a powerful brand processing the payments. The main goal of any business is to attract more customers, which will, in turn, lead to an increase in sale numbers. Visa Checkout is – allegedly – more effective when it comes to conversion. Customers who start the checkout process through this solution are more inclined to complete the payment compared to alternative options. Part of this success can be attributed to how Visa Checkout is active in 16 countries around the world, serving over 10 million consumer accounts. 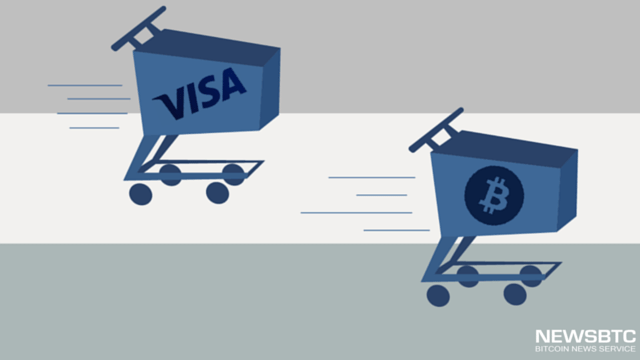 With a joint focus on both e-commerce and m-commerce, the feature created by Visa allows for easy and convenient purchases regardless of which device is being used. In fact, Visa is one of the very first companies realizing how important the digitized aspect of our society has become in recent years. While traditional financial institutions are only now exploring the boundaries of mobile services, Visa Checkout has been available to businesses and consumers for slightly over 18 months now. Other major brands – such as Starbucks, Match, and even NFL Shop – have inked a deal to take advantages of the features offered by Visa Checkout. Furthermore, Walmart.com has unveiled their plans to support Visa Checkout at a later stage this year. But at the same time, various companies in the Bitcoin sector are targeting these major brands as well and offer customers discounts of up to 20% to boot. There is no better feeling than enjoying a convenient method at your favorite store or coffee place. Starbucks’ customers have been able to pay with Bitcoin in various countries around the world for quite some time now. The best thing about this solution is how there is no additional hardware or software infrastructure required. Consumers simply have to install the Fold application on their mobile device. Truth be told, the Fold app works in an ingenious way that makes it easy for everyone to understand. Top up the generated Bitcoin wallet with a certain amount of funds one wants to spend, and once the transaction is confirmed by the network, Fold will grant the user a Starbucks gift card for that specific balance. Or to be more precise, Fold will offer them that gift card value at a 20% discount. This digital gift card can then be scanned by the cashier at Starbucks, and funds are debited from the account. Any unspent funds remaining behind will be reclaimed by Fold, and the user can then get their leftover Bitcoin balance back. All in all, this creates a very pleasant experience for the consumer and another frictionless transaction for Starbucks. Offering such a large discount is one of the areas where Bitcoin will always have a leg up over its competitors. Accepting credit card payments can become cheaper, but customers will never see a discount of up to 20% by any means. Bitcoin, on the other hand, costs nothing to accept, as transaction fees are paid by the sender. This allows businesses to offer a discount if they so choose, or let an intermediary like Fold handle that part of the business for them indirectly. Merchants have no excuse not to accept Bitcoin payments, as there is no cost involved for them to do so. Even though the popular digital currency has not become a mainstream trend just yet, any business should be prepared for the change that is coming to the financial world. Every additional customer is beneficial to a business, and Bitcoin is the way a lot of us prefer to pay.